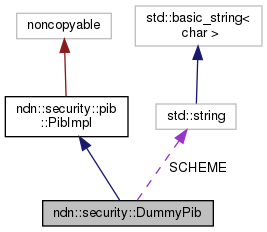 static const std::string SCHEME = "pib-dummy"
Definition at line 36 of file dummy-keychain.hpp. Definition at line 72 of file dummy-keychain.cpp. Set the corresponding TPM information to tpmLocator. Definition at line 77 of file dummy-keychain.cpp. Definition at line 83 of file dummy-keychain.cpp. Check the existence of an identity. identity The name of the identity. true if the identity exists, otherwise false. Definition at line 89 of file dummy-keychain.cpp. If the identity already exists, do nothing. If no default identity has been set, set the added one as default identity. identity The name of the identity to add. Definition at line 95 of file dummy-keychain.cpp. Remove an identity and related keys and certificates. If the default identity is being removed, no default identity will be selected. If the identity does not exist, do nothing. identity The name of the identity to remove. Definition at line 100 of file dummy-keychain.cpp. Erasing all certificates, keys, and identities. Definition at line 105 of file dummy-keychain.cpp. Get the name of all the identities. Definition at line 110 of file dummy-keychain.cpp. Set an identity with name identityName as the default identity. If identityName identity does not exist, it will be created. identityName The name for the default identity. Definition at line 118 of file dummy-keychain.cpp. The name for the default identity. Definition at line 123 of file dummy-keychain.cpp. Check the existence of a key with keyName. Definition at line 129 of file dummy-keychain.cpp. If a key with the same name already exists, overwrite the key. If the identity does not exist, it will be created. If no default key of the identity has been set, set the added one as default key of the identity. If no default identity has been set, identity becomes the default. identity The name of the belonged identity. key The public key bits. keyLen The length of the public key. Definition at line 135 of file dummy-keychain.cpp. Remove a key with keyName and related certificates. If the key does not exist, do nothing. Definition at line 141 of file dummy-keychain.cpp. Get the key bits of a key with name keyName. Definition at line 146 of file dummy-keychain.cpp. Get all the key names of an identity with name identity. The returned key names can be used to create a KeyContainer. With key name and backend implementation, one can create a Key frontend instance. the key name component set. If the identity does not exist, return an empty set. Definition at line 156 of file dummy-keychain.cpp. Set an key with keyName as the default key of an identity with name identity. Definition at line 164 of file dummy-keychain.cpp. The name of the default key of an identity with name identity. Pib::Error no default key or the identity does not exist. Definition at line 169 of file dummy-keychain.cpp. Check the existence of a certificate with name certName. certName The name of the certificate. true if the certificate exists, otherwise false. Definition at line 175 of file dummy-keychain.cpp. If a certificate with the same name (without implicit digest) already exists, overwrite the certificate. If the key or identity does not exist, they will be created. If no default certificate of the key has been set, set the added one as default certificate of the key. If no default key was set for the identity, it will be set as default key for the identity. If no default identity was selected, the certificate's identity becomes default. certificate The certificate to add. Definition at line 181 of file dummy-keychain.cpp. Remove a certificate with name certName. If the certificate does not exist, do nothing. Definition at line 186 of file dummy-keychain.cpp. Get a certificate with name certName. Definition at line 191 of file dummy-keychain.cpp. Get a list of certificate names of a key with id keyName. The returned certificate names can be used to create a CertificateContainer. With certificate name and backend implementation, one can obtain the certificate. The certificate name set. If the key does not exist, return an empty set. Definition at line 205 of file dummy-keychain.cpp. Set a cert with name certName as the default of a key with keyName. Pib::Error the certificate with name certName does not exist. Definition at line 213 of file dummy-keychain.cpp. Get the default certificate of a key with keyName. Definition at line 218 of file dummy-keychain.cpp. Definition at line 232 of file dummy-keychain.cpp. 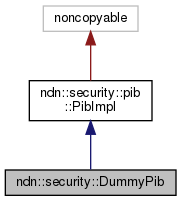 const std::string ndn::security::DummyPib::SCHEME = "pib-dummy"
Definition at line 129 of file dummy-keychain.hpp.